Gabe Walkup hopes to reach 1,000 yards rushing for the season when the Cannon County Lions play Upperman Friday. On an early Friday evening when Cannon County's football team is enjoying its bye week and most of the players are taking satisfaction in a rare night off, there is one who is doing what he knows best. Most Friday nights at 6:30 p.m., Cannon County senior tailback/linebacker Gabe Walkup is making final preparations for the upcoming football game. He's focused, intense and ready to do whatever it takes to help his team have a chance to win. Though there is no game on this night, Walkup is still going through the routine - albeit from a much different perspective. Then again, he knows only one way to do things - the right way. While most of his teammates are enjoying the night off, Walkup is at home preparing for his ACT Test the following morning. Odds are he wants to make sure he is as prepared as possible for his college entrance exam. It is really no surprise considering the manner in which Walkup approaches every aspect of his life - putting himself in position to be as prepared as possible for what lies ahead. Most players and coaches at Cannon County realize what Walkup represents. Though his team may be winless, Walkup is a winner. Football may just be a game and one that Walkup plays exceptionally well, but the way he competes demonstrates why he is a solid person on and off the field. "(Walkup) is consistent and he gives you the same day-in, day-out," Cannon County Head Football Coach Joel Schrenk said. It is easy to overlook an 0-9 football team; however, it is nearly impossible for coaches to neglect what Walkup brings to the field. All you have to do it put the game film in the projector. Those who have the privilege of seeing him first hand can attest. Walkup is on the verge of reaching the 1,000-yard rushing plateau, needing just 84 yards at Upperman in the season finale to accomplish the feat. He has exceeded 100 yards rushing in six games this season and he has led the team in rushing in all nine. All this despite the fact every opposing defensive coordinator devises schemes to stop him. "When we were preparing to play Cannon County I knew they ran the Tony Franklin spread offense and so you knew they were going to throw the football," said highly-successful MTCS defensive coordinator Steve Williams. "You don't really think of a spread offensive team running the ball that much but when we saw (Walkup) we realized that he would be someone to be conscience of the whole game because it was easy to see how dangerous he is. "You look at number 40 for Cannon County and realize you have to stop the pass, as well as the run, because he is a quality tailback. (Walkup) is the type of player that presents a lot of problems for defenses." Even though Cannon County suffered a setback against MTCS, Walkup proved Williams right. He rushed for what was a season-high 169 yards at the time and supplied the team's only touchdown; however, it was more the way Walkup played than what he did that impressed coaches on the opposing sideline. "I felt like we got some early breaks that gave us an early cushion (against Cannon County)," Williams said of a game that was decided by early in the third quarter as far as the scoreboard was concerned. "A lot of kids at that time will not continue to give all they have but what impressed me was that kid played as hard the last series of the game as he did the first. That tells me he has a lot of character and heart. Most kids wouldn't give what he continued to give. I remember telling our head coach how much heart I thought that kid had. Being a senior he epitomizes what a team player and leader is all about. He is setting a good example for those young players as far as how to play the game and playing it with respect." Walkup leads Cannon County in rushing, receiving and tackles, as well, from his linebacker position. Even when aspects of the game have been bleak, Walkup provides hope and it has not gone unnoticed. "Gabe is ruthless," junior teammate Damon Collette said. "No matter who it is, Gabe will beat them 1-on-1. We are 0-9 but I don't think there is anyone who can beat him 1-on-1. He never gives less than 100 percent and he has set a standard for the rest of us. Gabe is my best friend and I love the guy to death. I'm going to miss him being there next year but I know having him as a teammate and learning from him how to play the game is going to make me and this team better in future years." Walkup doesn't go all out because he's trying to score points or aide his cause following high school. He plays the game the way he plays because he realizes it is the only way to play. "I work out a lot and try to prepare myself for the season and the games," Walkup said. "What is the point in doing all of that, getting up at 6 a.m. in the summer and working out, going through all the practices, and preparing for the games if you are not going to play hard and give it all you got on Friday night? I put in a lot of work and effort to be the best I can be for the team and I believe you have to give the team all you have no matter what the score or no matter what point in the game. You always play the same way." Walkup's philosophy not only is correct but also does not go unnoticed. "Gabe is one of those guys who gets stronger as the game goes," Schrenk said. "He is such a phenomenal, physical player and he is so strong and has worked incredibly hard to get faster. He is an amazing, physical specimen. There are not a lot of kids in high school football that can do what he does. He is just physical and he pounds on people. Every game when you have the pre-game banter between coaches they always say, '40 is a beast.' They always game plan for Gabe and yet he still gets his yards and leads our team. That's quite a statement." Yet, Walkup is not worried about impressing opposing coaches. He does not worry about impressing college coaches. He does worry about being a good leader and leaving his mark. "It is very important to be a strong leader, especially when you have a young team like we do," Walkup said. "I don't want to quit and I never give up. That's the example I want these younger players to follow." 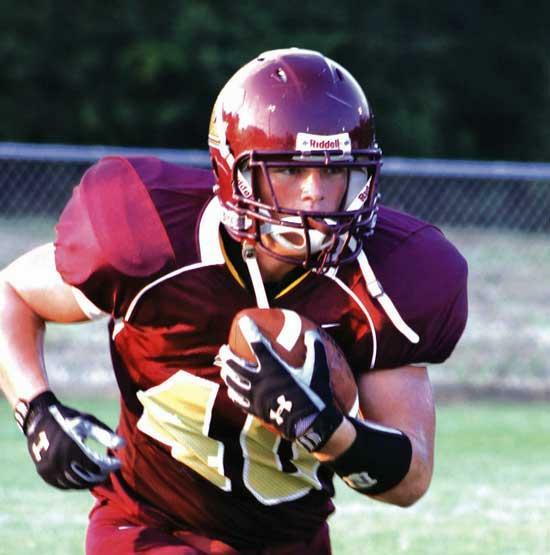 Walkup hopes there is a future in football for him after Cannon County. "It would be awesome to play college football," Walkup said. "I have been playing so long that it seems the natural thing. I hope there is a future there for me." "I think there is a place in college football for Gabe," Schrenk said. "It goes back to his size and strength. He works out a lot and is very strong. He has such raw ability and talent. There's always two prevelant questions college coaches ask, "How are his grades and what is his family life like? Gabe makes good grades and he comes from a great family. He was raised right. He has three or four younger siblings and you don't know how many times I've seen him work with them, baby-sitting when his parents work, doing whatever he can for the family. He's just a good all-around person and that's as important as anything." On the field, Walkup has proven his worth as far as having a chance to continue his football career. Last Friday night when most Cannon County players were enjoying their night off, Walkup was busy making last-minute preparations to assure he was as prepared as possible for taking the ACT. And that's why Walkup is not only a complete package as a player, but also as a person. He's a fine young man keep up the hard work. Wonderful story, exceptional young man. An example to follow for young student/athletes. I enjoy watching him play the game and hope to see him play college ball. Well said, Gabe is a wonderful person inside & out!